presentations in Committee Room 1 at 1pm. As a Reservist an individual will get paid for the time spent training, and a bonus payment for completing a certain amount of training days each year (usually 27 comprising of evenings, weekends and an annual camp). The pay scale will be based on what a Regular soldier with the same job and rank would get. For further information please contact Phil Deakin, Armed Forces Covenant Worker on afcc@warwickshire.gov.uk or 01926-476862. Nick Caswell, Veterans Outreach Worker from the VCP will be there to support any veterans who attend. For more information please call 02476-322048. 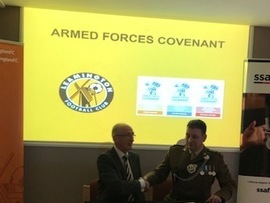 ‘Leamington FC Chairman Jim Scott recently signed the Armed Forces Covenant for the club, pledging to uphold the key principles of the Covenant and support serving personnel and veterans. The Covenant was signed jointly by Lieutenant Colonel Paul Walkley, Commanding Officer of 2nd Battalion Royal Irish Regiment, in a ceremony held at the Club’s Phillips 66 Community Stadium in front of local dignitaries, both serving and former military personnel and invited guests. 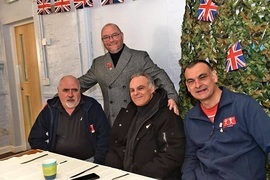 The Club are supporting the employment of veterans, offering flexibility to Reservist employees and families of serving personnel and taking part in the Tickets for Troops Initiative. Kineton Station held its annual ‘Health Fayre’ on Monday 25 March. 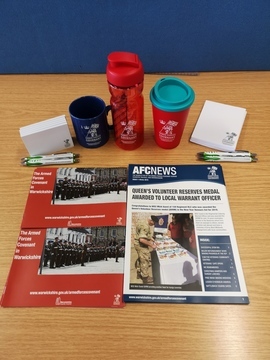 The stall on the Armed Forces Covenant was very popular and gave Phil Deakin, AFC Worker for Warwickshire County Council, the opportunity of promoting the benefits of the Covenant to both serving personnel and their spouses. Now, was it Phil’s winning personality or the goodies that were on offer that attracted people to the stall?! If you’ve missed it, serving personnel can still learn about the Covenant here and spouses here. after winning the annual Love Solihull flowerbed design competition. The competition is in partnership with the Royal British Legion and their ‘Thank You’ campaign, which last year marked 100 years since the end of World War One. The competition received more than 300 entries from 12 local schools but it was Tamzin Clarke, age 12, who drew the winning entry. 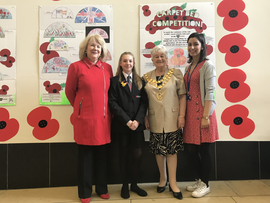 Her design will be used to transform a flowerbed at Malvern Park and showcases the importance of the Poppy as a symbol of hope and remembrance. April and can be seen by the exit next to Zara.